Rochester Police Officer John Gantert, right, sits with his attorney Tim Goulden at the Commission on Use of Police Personnel Files meeting Wednesday. Deputy Attorney General Ann Rice is pictured speaking. Steve Arnold, representing the New England Police Benevolent Association is pictured standing. Gantert, who was later reinstated as a patrol officer to the Rochester Police Department, paced the floor of hearing room 303 at the Legislative Office Building in Concord. He wanted members of the Commission on the Use of Police Personnel Files to know what it’s like to get stuck on a list of potentially dishonest police officers, how it’s nearly impossible to get off the list. “My scenario, it gets me so worked up,” Gantert told them. Fighting to get off the list has cost him $15,000 out of pocket so far with no end in sight, he said. An arbitrator reinstated Gantert, but sustained a finding that he violated standard operating procedure “as it related to the falsification of reports,” and said that although discipline was warranted, discharge was too great a penalty. Gantert filled out a form relative to dangerousness in a domestic violence case without personal knowledge as to the proper answers to questions on the form, the arbitrator ruled. Back at work, Gantert found it impossible to get off the Laurie list. Gantert lost his appeal to Superior Court and today, Thursday, the state Supreme Court will hear his appeal. Gantert planned to be there for oral arguments. His attorney, Tim Goulden of Nashua, told the commission that Gantert filled out the form while booking a man for domestic violence because he believed it had to be done before the end of the shift even though the arresting officer had gone home. “All he did wrong was to show initiative,” Goulden said. Gantert said he thought he was following the policy. “I understand now it was wrong,” he said. “At no time did I show any deceit. At no time did I lie,” Gantert said. Each of the state’s 10 county attorneys maintains a Laurie list of the names of sworn law enforcement personnel who have been identified as individuals with potential credibility problems. It’s a very secretive process in which a police chief is responsible to disclose to county attorneys information in police personnel files that could negatively reflect on the officer’s credibility or character. Even prosecutors generally have no access to police personnel files. The names on the list are kept confidential. Some county attorneys say they get the name of the officer only, that they have no knowledge of what prompted the Laurie designation. As the process has been handled in New Hampshire, a judge would decide if the officer’s credibility issue would be disclosed. The defense could then use the information to impeach an officer’s testimony. Defendants are constitutionally guaranteed all material favorable evidence, including that in confidential police personnel files. Police call Laurie designation the “gift that keeps on giving” because it stays with an officer unless a judge orders it removed, which is rare in New Hampshire, according to Steve Arnold, representing the New England Police Benevolent Association at the meeting. Arnold questioned the need for a Laurie list and told commission members that officers have been placed on the Laurie list without being disciplined. He described it as an unfair process that can end a career. Stephanie Housman, deputy chief appellate defender, who sits on the commission, asked if it was the discipline or the Laurie designation that limits careers. “Laurie is worse,” Arnold said. Housman noted that police personnel records are the only personnel records that are confidential by law in New Hampshire. Deputy Attorney General Ann Rice said the protocol written by former Attorney General Peter Heed on Laurie is being updated. One area the state is considering would be to have the county attorney involved with police chiefs in Laurie designations. 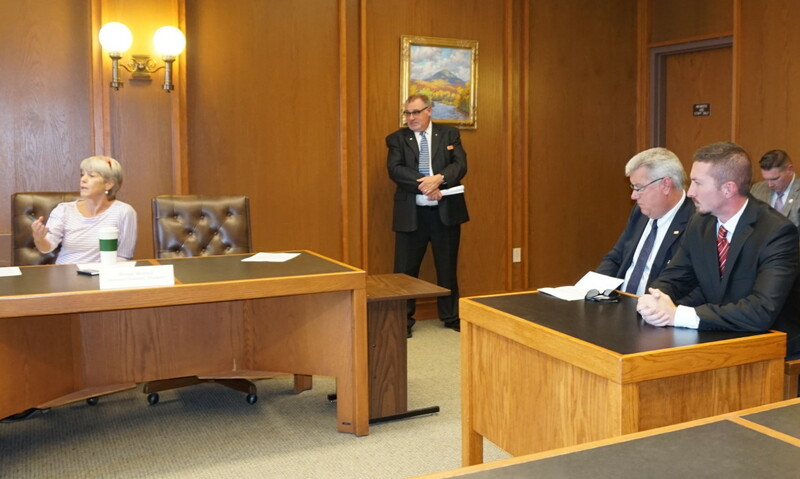 The commission, chaired by state Sen. Sharon Carson, R-Londonderry, is studying how to provide law enforcement officers with due process relative to Laurie lists. It will report its findings Nov. 1. The problems with the complex Laurie process are too many to deal with in one piece of legislation, she said. “I hope we can all agree that once someone gets on the list, there is no way for them to get off,” Carson said. Legislating due process for police officers relative to Laurie listing should be the focus of the commission, Carson said. There will be one more commission meeting before it reports, she said. Gantert said he thinks about his Laurie designation, how he was treated unfairly, just about every day. “I was shattered. “I still wake up some mornings in a cold sweat thinking it was a bad dream,” Gantert said. If there is a bright side, it may be that Gantert is better able to relate to the people he is sworn to protect, he said. When people are down on their luck, Gantert said he understands and is often the officer called to help talk to barricaded subjects, people who are feeling suicidal. Last year, he and two other officers were singled out for the department’s Life Saving Award for helping save the life of a woman who wasn’t breathing after overdosing on heroin. Even if Laurie designation means he will be limited to the rank of patrol officer because of his Laurie designation, Gantert said, well, that’s a proud profession, too.